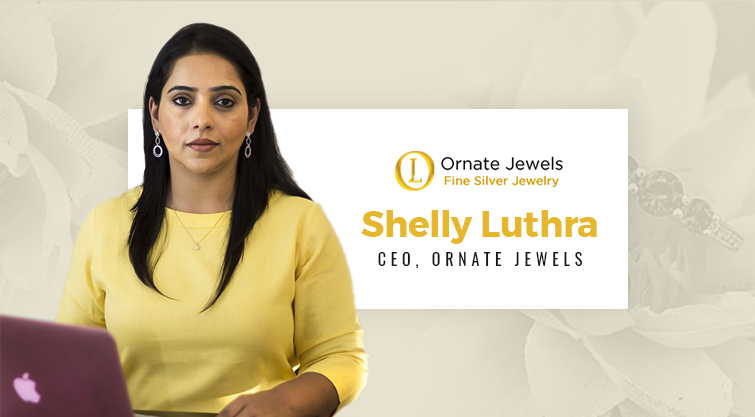 Portraying the very definition of being a courageous entrepreneur and a caring mother, Shelly is the owner of an online Silver jewelry business called ‘OrnateJewels.com’. It all started as a zeal and passion for jewelry and turned into a full-fledged online ecommerce business. What makes her jewelry business different from others is that it is the only website where you can buy anti-tarnish jewelry at budget friendly price without any middle men. Her business caters to women of all age, budget, profession and lifestyle. Shelly is very confident that she can achieve a turnover of over 3 times the current one this year. Inspiring other women entrepreneurs, she says “Work hard, stay strong and never ever give up on your dreams”. We are the first fine silver jewelry online store in India which provides the everyday wear jewelry which is pure and allergy free. It’s stamped for purity and even people with skin issues can wear it worry free. Moreover it’s guaranteed to not turn black. We are the first store in India which manufacturers and retails as well hence we are able to offer the best quality, designs and lowest prices. We always wanted to bring affordable yet luxurious, modern and daily wear jewelry to the Indian women. It’s been challenging to find professional people who deliver. Companies you outsource your work to don’t deliver as they should. Commitment and professionalism is really lacking in our system. Finding the right people i feel has been and still is the biggest challenge. It took a while to overcome the self-doubting mindset but with each day i took one step forward. I vowed to not give up regardless the many challenges that come my way daily. We want to add a little sparkle to every Indian women’s life .